Free shipping to the lower 48 United States for this portable basketball hoop. 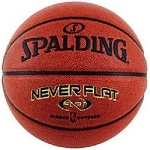 Easily set up and rearrange your home basketball court with this Spalding portable basketball system. The 66291 comes with a portable base that allows you to easily roll the product to the desired location on your property and start playing basketball immediately. 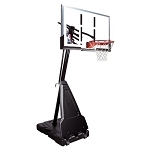 The 66291 comes with a 54 inch acrylic basketball backboard with a steel frame. The angled-back design of the pole-to-base mount distributes the weight of the system to help stabilize the unit while in use. Includes the Pro Slam breakaway rim and an all-weather white net; simply assemble the product and start playing the same day. 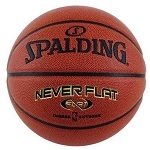 Comes with the manufacturer warranty from Spalding. Backboard material of construction: acrylic. Acrylic provides a better rebound when compared to plastic backboards. The backboard is framed in steel, which improves the rigidity of the backboard and the longevity of the mounting bracket system. Includes the Pro Slam Breakaway Rim. This backboard size is great for beginning to intermediate level players. Backboard to pole clearance (directly up from the base): 14 inches. Pole construction and design: 3-piece, 3.5 inch diameter round. Backboard height is adjustable from 7.5 feet to 10 feet in 6 inch increments. Pole angled forward at 20 degrees. Portable base capacity: 34 gallons. Base can fill with water or sand. Includes manufacturer warranty: 1 year on parts, 5 years on backboard. Backboard frame pad included to help protect players. Shipping dimensions: 55.43 inches x 37.12 inches x 8.58 inches. Product ships via an LTL freight carrier for a curbside delivery. This type of delivery requires the customer to be present to sign for the delivery and to move the product wherever needed from on the truck to property. UPC: 6 89344 33474 5. Had a good experience with purchase from competitive products. Shipment came on time and no issues. good customer service and good pricing too. Assembly was not a problem at all. Spalding 66291 Portable Basketball Hoop is good quality product. I am very happy I bought this from Competitive edge. email or on the phone. The response was very prompt. I give you A+ for customer satisfaction. Dimensions: 55" x 37" x 9"